Timothy Newlin brings more than 40 years of experience to his litigation and business law practice. He has extensive experience in the defense of workers' compensation claims. Tim's practice encompasses clients in many industries, including construction—most notably, Walsh Construction—and health care. He has represented many facets of the OSF Healthcare System including: OSF St. Francis Medical Center, OSF Corporate, and OSF St. Mary's Hospitals. Throughout his career, Tim has practiced in the areas of real estate, family law, personal injury, workers' compensation, products liability, probate, toxic torts, creditors' rights and insurance claims defense. 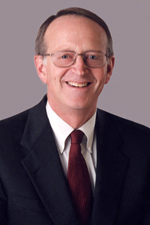 Prior to joining Hinshaw, he was a partner at a defense firm in Peoria, Illinois. He was also an Assistant Vice President at National City Bank—now PNC Bank—where he worked as an attorney in the area of Estate Settlement. In April 2011, Tim was appointed to the position of Peoria County Public Administrator/Public Guardian by Illinois Governor Pat Quinn and confirmed by the Illinois State Senate. He served in that position through 2013. Defended a hospital at trial resulting in judgment in client's favor. The defense against a claim involving alleged workplace trauma was based upon the opinion testimony of an independent examining physician at evidence deposition. Defended a hospital at trial resulting in judgment in client's favor. The defense against a claim involving alleged back injury was based upon the testimony of an independent examining physician at evidence deposition.